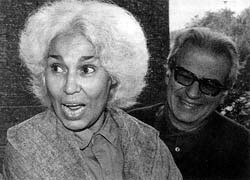 Egyptian feminist, sociologist, medical doctor and militant spokesperson for Arab women's issues, Nawal El Saadawi is one of the most widely translated Egyptian writers whose works currently appear in dozens of languages. Born in 1931 in a small village outside of Cairo. El Saadawi was raised in a large, traditional household. Her youth was an interesting mix of traditional and progressive influences. In a household where the father insisted that all of his children be educated, she was nonetheless "circumcised" at the age of six. El Saadawi attributes some of her revolutionary ‘fire’ to her mother, who’s married status prevented her from fully actualizing activist tendencies. Despite religious and colonial dictates imposed on rural women, El Saadawi graduated from the University of Cairo in 1955 with a degree in psychiatry, and went on to become Egypt's Director of Public Health. Over the years, El Saadawi’s writings resulted in an ongoing string of difficulties and dangers in her life. In 1972 she lost her job in the Egyptian government. The magazine, Health, which she had founded and edited for more than three years, was closed down. In 1981 President Sadat put her in prison, where she remained until one month after his assassination. From 1988 to 1993 her name appeared on several death lists, and she was forced to live in exile. In 1991, the government decreed that the Arab Women’s Solidarity Association (AWSA) be closed down, as well as Noon, the magazine published by that organization. In 2004, her novel, The Fall of the Imam, was banned in Cairo, and new novel, Al Riwaya ( in Arabic ) was banned in Egypt . Dr. El Sadaawi is often pictured – on her website and elsewhere - with her husband and collaborator, Sherif Youssef Hetata, whom she was nearly forced to divorce (according to Hisba law) in 2001. Dr. Hetata is himself a novelist and medical doctor who, since 1968, has devoted himself to novels, and has translated some of the works of Nawal El Saadawi into English.